Back to more familiar topics for this blog. I’ve linked to this before, but in the context of today’s revelations — well, today’s decision to not keep lying about what everybody already knew — regarding the NSA and various secret surveillance operations, now might be a good time a take a look at Senate Report 93-549, produced in 1973 by the Special Committee on the Termination of the National Emergency. Back when Congress, for one brief shining moment, tried to do its job, the committee reviewed the modern history of the super-powerful executive branch and what the report called the “aura” of ongoing, overlapping national crisis in which extensive power came to dominate the concept of the presidency — most interestingly, given today’s situation, by having that power delegated by Congress via new legislation. A review of the laws passed since the first state of national emergency was declared in 1933, reveals a consistent pattern of lawmaking. It is a pattern showing that the Congress, through its own actions, transferred awesome magnitudes of power to the executive ostensibly to meet the problems of governing effectively in times of great crisis. Since 1933, Congress has passed or recodified over 470 significant statutes delegating to the President powers that had been the prerogative and responsibility of the Congress since the beginning of the Republic. No charge can be sustained that the Executive branch has usurped powers belonging to the Legislative branch; on the contrary, the transfer of power has been in accord with due process of normal legislative procedures. It is fortunate that at this time that, when the fears and tensions of the cold war are giving way to relative peace and detente is now national policy, Congress can assess the nature, quality, and effect of what has become known as emergency powers legislation. Forty years ago, they were looking back forty years, and they thought they were going to end the emergency. Is this yet another Tea Party rant against abuse of the “necessary and proper” clause and the hegemony of the welfare stare? No, no, no. For those who don’t know Amar and his benchmark work The Constitution: a Biography, this is liberal history in a nutshell, ideally expressed by one of our brightest academics, a consultant to “The West Wing” no less, mentioned by some as a future Supreme Court nominee. He’s doing yeoman work making the rounds in constitutional defense of the Health Care Act. And as a speaker he’s got his own kind of charisma. To me the talk is a fun crash course in exactly the wrong way to look at the founding, a quick summary of the story I’ll never be able to undermine the way I’d like to. Check it out! In his talk, Amar runs deftly and powerfully through what I can’t see as anything but our dominant narrative about the Constitution: that the document was structurally, “in its DNA,” as Amar says, and possibly against the founders’ conscious intentions (an idea Amar types always toss off without exploring), the most democratic thing ever created to that point, with almost all of its later expansions into further democracy almost magically hardwired from day one, and thus a mighty pivot in world history, with only one horrible thing wrong with it: the adoption of African slavery via the infamous three-fifths clause. The Constitution was thus elementally Jacksonian, in two key respects: admirably democratic (since Amar, with so many others, takes it as given that the rise of the white working class and the development of small-scale capitalism associated with Jackson is fundamentally democratic, making the Jackson administration in a special sense the “real” founding); and horribly “slaveocratic” (as Jackson, unlike slaveowning founders like Jefferson, was unapologetically pro-slavery). In this reading — say it with me — the founders’ Constitution “failed” (tragically, as it was so earthshakingly democratic), as did the systems of Jacksonian America, precisely because of the slaveocratic element, leading to a civil war that, had the founders only faced up to the slavery nightmare, pragmatically revising the three-fifths clause over time, we could have avoided. It was left at last to Lincoln to hit reset and begin to get the American balance right: democracy without slavery. Then the Civil Rights movement and the liberal triumphs of the twentieth century and there you have it. Thank you and good night! To my eye today, the judge and the lawyers in the Poindexter trial were keenly aware of Reagan’s condition, especially as the witness tired late in the day. Reagan said, for example, that the first time he became aware of “a diversion” of proceeds came in that courtroom, that day, and he seems to have meant it. And when badgered by a prosecuting attorney, he had no evident grasp of either the purport or the content of testimony he’d made earlier the same day. Given the ’84 debates — the last time most of us had seen Reagan speak off the cuff in any significant way — the decline of ’90 wasn’t surprising. Indeed it vindicated the creepy, unprovable, and strong impression from six years earlier, when Reagan was about to sail triumphantly into his second term as president. What I have not been able to recall is anything specific about what I might have been responding to, in Reagan’s comments and manner during the ’84 debates, that gave me such a distinct impression that something was wrong. I only remember thinking and saying that he seemed out of it; the debates themselves are a blur. Which, when it comes to memory, I find interesting in itself. In the past few days, therefore, with the centenary, and a book addressing Reagan’s Alzheimer’s by one of his sons, I’ve been time-traveling backward, trying to arrive at the age of 28, half the age I am now, when I was watching those debates on TV. One thing I find, which will make no sense to 28-year-olds (until they get to be 56): as I look at the videos, the Reagan presidency doesn’t seem long ago at all. Reagan had a huge impact on our lives in the ’80’s, and I watched him very closely at the time. It’s not that it all comes flooding back, it seems part and parcel of today. For me, his inflections and mannerisms remain deeply familiar and present-tense. Familiar, not beloved. I voted against him — against the Republican platform, that is, which in 1980 had finally been seized definitively by the party’s right wing, had finally triumphed in casting taxation and social welfare as unqualified evils, and began its project to make the American rich richer, at the expense of everyone else, on the pretext that a rising tide lifts all boats. Till Reagan, the jury was out on how the country was going to go on those issues. Then the jury wasn’t out any more. I argued about it fairly bitterly with “Reagan Democrat” friends at the time. But FDR also transformed expectations. Thanks to him, “performs transformations” counts as one of the skills supposedly critical to certain kinds of presidential candidate’s resumes (JFK played a role in creating that expectation too, mainly by being a certain kind of gorgeous and getting killed). The president was originally just supposed to execute the laws. Real transformations very rarely occur — rarely should occur — via a presidency. Yet I observed Reagan at all times with a genuine, half-amused admiration, even awe. 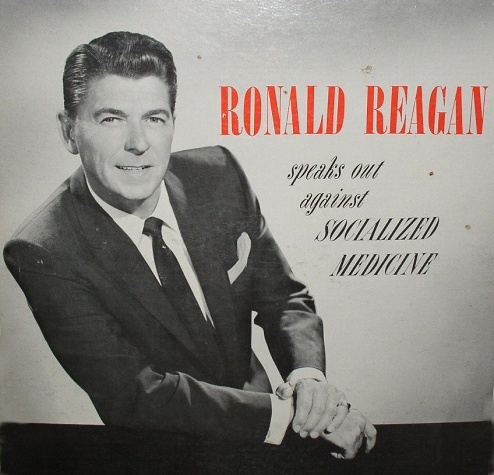 “I like Ronnie,” I would say, just to bug lefty friends. His second convention acceptance speech was Americana par excellence, a thing of beauty. Beauty is not truth, nor truth beauty, except in transcendent moments like the one conjured by Keats. But there were times when Reagan had the beauty thing nailed, and on that score, we did not see his like again until Obama, who clearly admires what Reagan could do with a public appearance (and who ran on the transformation magic trick). Cornball, mock-epic national poetry is not a requirement of the job either, as many presidents have made clear. But some happen to have the knack. In other ways, of course, looking back at the 1984 debates makes 1984 seem very long ago indeed. Barbara Walters’s hair! Fred Barnes — so young! Blah! Blah! … Reagan, though, is timeless. He’d always been Ronald Reagan and always would be. I don’t like charisma, but there it is. Say “first amendment” to most people, and they’ll say “freedom of speech.” They’re right, of course, as far as it goes. But. The failed Tea Party Senate candidate Christine O’Donnell drew some laughs a while back when she asked, she hoped rhetorically, where in the U.S. Constitution church and state are separated. Her opponent knew the answer and paraphrased the relevant part of the First Amendment aloud. Her laughing audience were law school students and faculty, so they knew the answer too. But many otherwise well-informed people, who are sure that there is a constitutional separation of church and state, don’t know where in the Constitution to find it; or know that the First Amendment opens by disestablishing religion, and only then goes on to protect speech; or that the amendment is based on what was known during the founding period as the Virginia Statute for Religious Freedom (Jefferson, its author, listed it among his proudest accomplishments). That ignorance raises some weird questions. One has to do with the inveterate scorn of educated liberals for the likes of O’Donnell. It’s far from clear that many who deem themselves intellectually superior to her could have responded to her challenge (it’s good that her opponent could). The challenge might seem a dopey one, but it would have left plenty of liberals sputtering. And since she is not well-educated, and those liberals generally are (in ways other than law and history), that’s bizarre and disturbing. “These Tea Party people don’t know any history,” fume some I know, and while in some cases (like O’Donnell’s) that’s true, in others it’s not. A lot of them know American history because they just happen to like it. You could argue with their interpretations — but only if you knew something about it yourself! Me: The other day the President told reporters that the courts of the 1960’s had perhaps been overly activist. Now we’re getting reports that the administration is exploring possible qualifications of the Miranda rule, in cases of people suspected of terrorism. Would it be fair to conclude that the Miranda rule is a good example of an area where the President feels the 1960’s courts were overly activist? Me: I mean it’s OK with me if he does think that. I JUST REALLY WANT TO KNOW WHAT HE THINKS! OPS: That’s enough, Bill. Yes, Brian?